I want to wear these Tabitha Simmons tie silk mary janes every single day this Fall. I mean seriously, how perfect are they. Beautiful fabrics. Gorgeous shape. Menswear done ladylike. I'm totally in love. Sadly for me they don't come in my size, thereby saving me from myself. 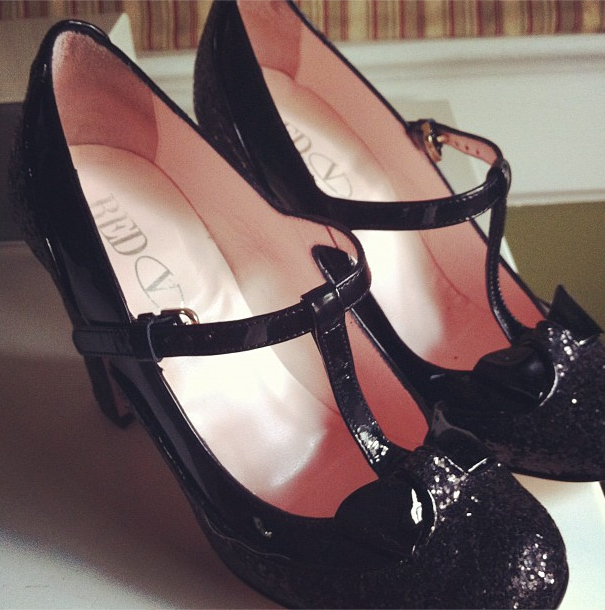 But they are gorgeous though. 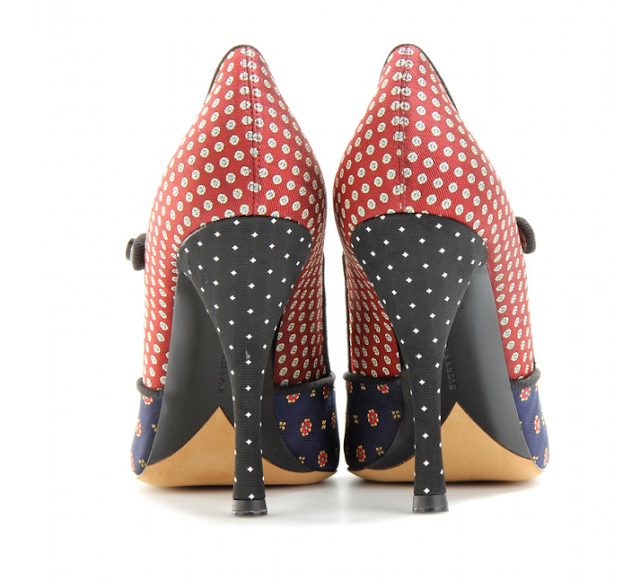 As you know, I'm a sucker for a good mary jane heel. 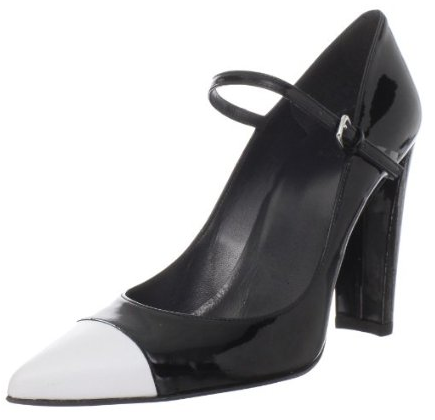 And when saw this black and white pair on Atlantic Pacific's blog, I went right out and nabbed a pair. I just bought a B&W tweed pencil skirt from JCrew (well basically, this whole outfit!) and I knew they would be perfect with them. 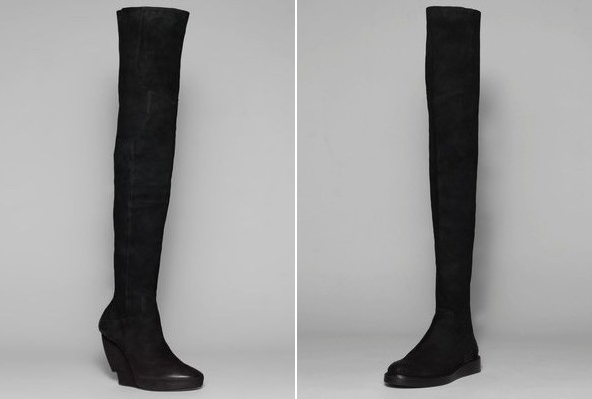 The best part is that they are now on major sale, down to $140 from $365. So nab them while you can, especially since Endless.com is being folded into Amazon. Not sure how long the sale price will last. 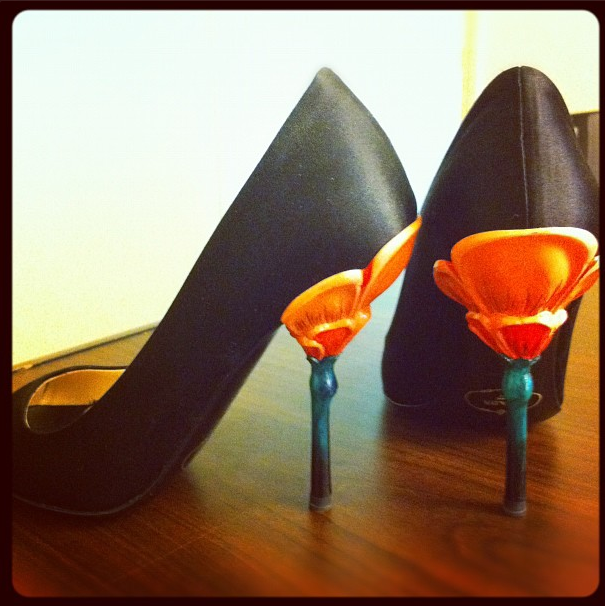 We all need a bit of shoe fun for the day, right? I just watched this video, "The Shoes of NYFW" created by Textbook for Lucky. While it's always fun to see what shoes people are wearing, especially to Fashion Week where they're showing off their favorites (or at least those they think will grab attention), what I most noticed are how many people don't really seem comfortable in their shoes. It's actually a bit funny to me. 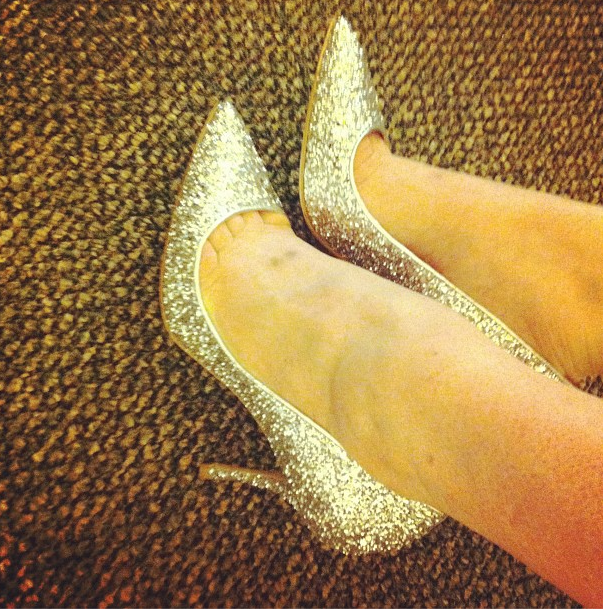 I bring heels with me to New York but I wear them very little as I go around the city. And it took one day at NYFW to convince me that there was no way I was going to wear heels all day. Walking, waiting, carrying gift bags and equipment, there's a lot going on and not a lot that's easy on your feet. If you can't walk in them, don't wear them. 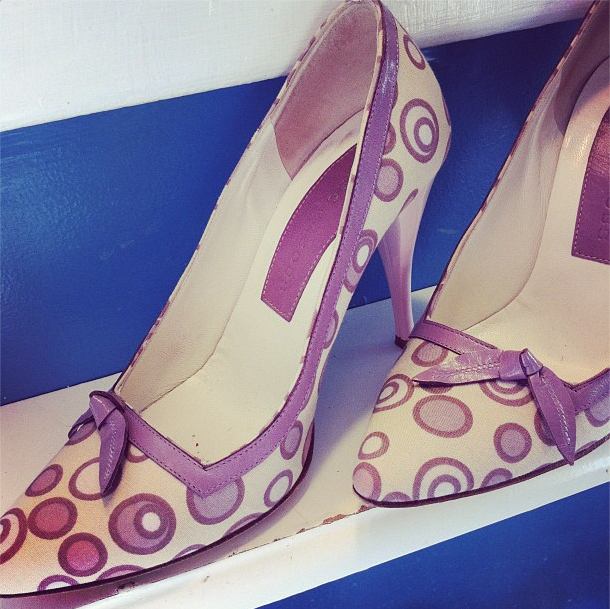 Or at least plan a quick getaway strategy and a pair of back-up flats! 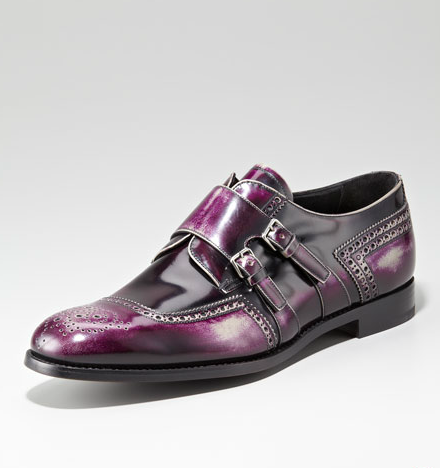 It's not often that I say this, but looking at these sweet Prada monkstrap oxfords in deep violet, I wish I could wear them. I love the straps, color and distressing. 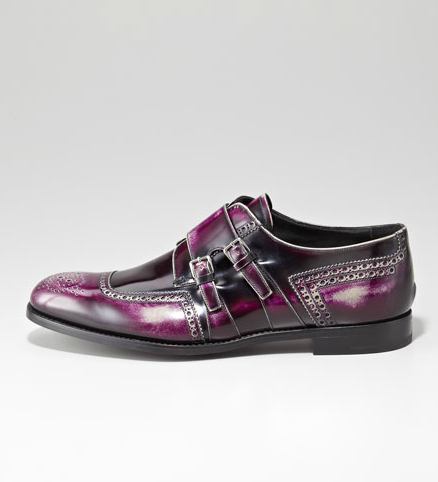 There are 3 designs in this special collection from Prada for Bergdorf Goodman's 111th anniversary. I can't fit into them and they're not really my husband's style. So sad for me, because these are sharp! In the world of online branding and shopping, visuals are key. Since you can't see or try on the product, we the customers are placing a lot of faith in the descriptions and how the products are visually presented. So we need good clear imagery and multiple views. But don't forget the romance. What's going to catch my eye first is a gorgeous shot. 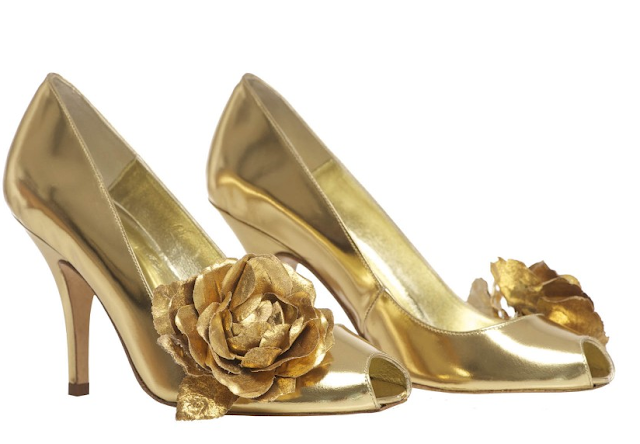 Let's use these two images of the Freya Rose "Ennis" gold rose peep-toe heel as an example. The shoe practically glows. 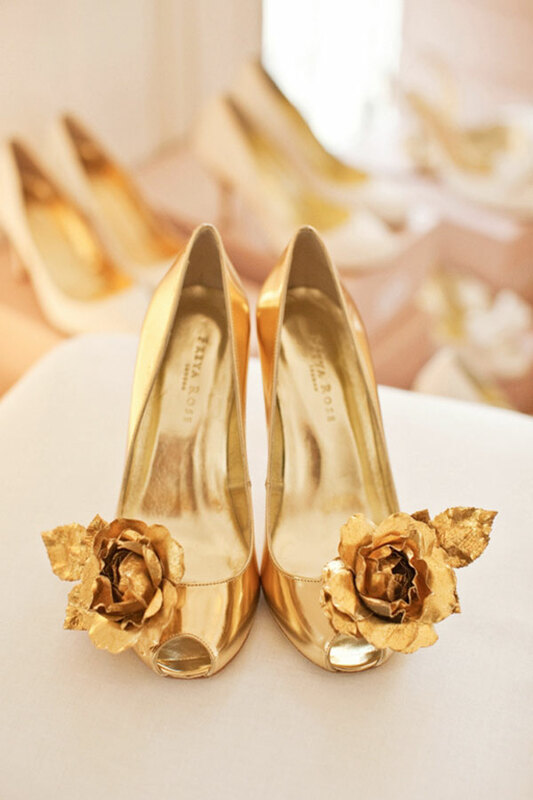 Who wouldn't want these molten gold heels on their feet. 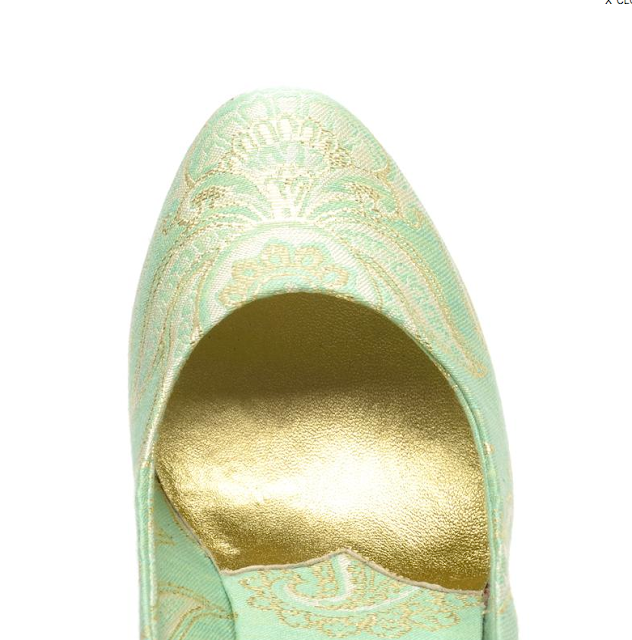 But then I went to the Freya Rose site to order them. And then I saw the site's images. What happened??? Where did my lovely dreamy feeling go? I was no longer entranced. In fact, I was a bit turned off by them. It could be the different view of the shape or the harsh lighting but now I'm not as smitten. I still love the rose element but now I wish it was on a different shoe. If the brand's site had used the first image above, I would have bought them. Now, my money will probably stay in my pocket. Sure, it's good to get a straightforward view of the shoes but don't forget to romance the customer a little bit too. I have been so swamped lately! Between work and travel and a new chicken rescue, I haven't had time to do much shoe perusing. I've also been filling the little free time I have with reading the Game of Thrones series. I've only got a few thousand pages to race through... not sure why I have no spare time! 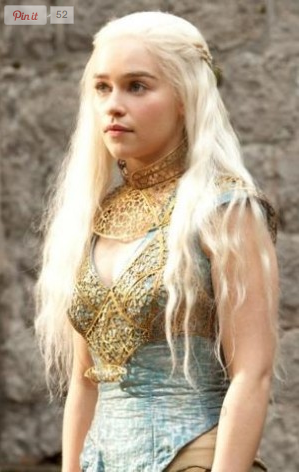 I thought perhaps I could see if there had been any great collaborations or designers inspired by the series. 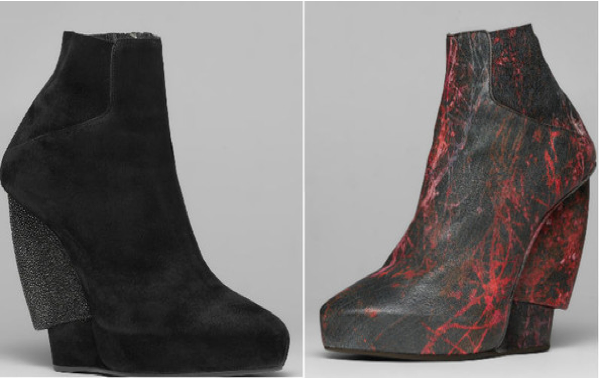 Sadly, I found that Helmut Lang designers created a shoe capsule collection that was meant to evoke the grit and blood of the series. I can see the dark and the "blood" but these shoes look a bit too dystopian for the fantastical realms in the book and the show. I'd rather look to the actual clothing and style of the show for inspiration. Fashionista.com had a great interview with the hair and costume creators of the show. It's a longer article but well worth reading through, especially if you like all the details, like I do. Now, while everyone is out and about at Fashion Week, I'm going to hunker down with my books. 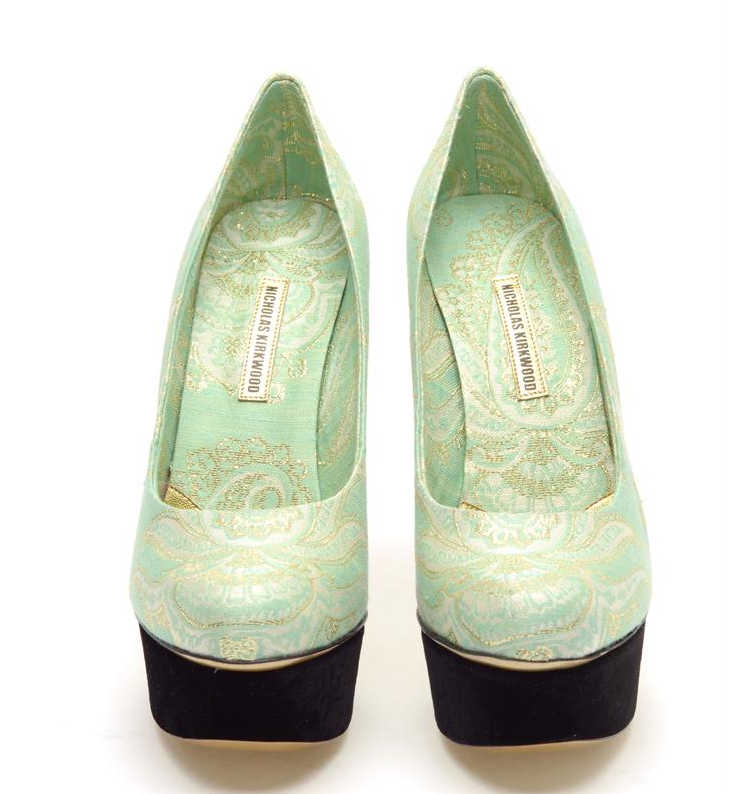 I'm a sucker for a pretty fabric, especially on a pair of stunning shaped heels and these Nicholas Kirkwood platforms are just amazing. The delicate fabric, in soft green, cream and gold, is contrasted by the strong heel and graphic platform both in soft black. The combination of the fabric and platform bring to mind the geta or okobo worn by the geisha or geisha-in-training or the Venetian chopines. It makes me wonder, the height of the chopines, for example, became "a symbolic reference to the cultural and social standing of the wearer; the higher the chopine, the higher the status of the wearer." Do you think this relates to the status of these shoes culturally now as well?